The big craze over at Beemaster is switching to only medium depth boxes. Yes there are some advantages like uniformity and lighter weight, but there are also some things I consider disadvantages, at least to me. One is more equipment and therefore more cost. One can also debate if there is any downside to breaking up the brood area more. But perhaps the biggest downside to me is the added work (and time) in doing a full inspection. Being the non-conformist that I am, I took the thing that bothered me the most and went the opposite direction. Even with deep supers, to do a full inspection of a 2-story deep colony, I need to go over 20 frames and remove one box to get to the other. So I decided to give double depth deep frames a try. Although each frame is heavier, they are still lighter than lifting even a medium box and there is no need to remove any boxes to get further down in the brood nest. Granted, if you need to move your hive around, this is not a solution for you. I’m doing this on a hive at my home which I don’t move. I know large deep frames are not new as Dadant used them. In fact, I used the Dadant frame as the inspiration for my design. I also must give credit to Michael Bush for the photo of the Dadant frame on his website. Two concerns that I had with the double deep frames where comb support and comb flatness. The comb support was address by putting a steel rod across the middle of the frame. Remember those free corrugated plastic election signs I use as starter strips? Now I have a use for the wire stands from these signs too 🙂 The rods not only support the comb, but would keep the frame rails from bowing. This is the same method used by Dadant. As for the comb flatness, I had experienced from my top bar hives that the bees will build a natural arc in the comb as they go. In fact, on the TBHs they will end up on the adjacent top bar if the hive is wide enough. So I decided to give comb guides a try. The Dadant frame appears to have triangular shaped guides around the inside of the frames. I had a pile of unused wedges from wedge top frames that I cut to fit and glued in. I sized the frames to fit in two stacked deeps as I didn’t want to make new boxes for this experiment. I started building Hoffman style end bars, but ended up switching to flat end bars and staples for spacing. I find the Hoffman style get packed with propolis over time and need scrapping. I find it somewhat challenging to hold a regular deep in one hand and scrap the propolis off with the other, I can’t imagine trying to do that with these. I’m interested in seeing how the staple spacers work and if there is significant less propolis to deal with, I might even switch to them on all my new frames. I decided to introduce one of these frames into a hive to start. This way there would be frames of comb on either side to help guide the bees in the comb building. At first inspection I was a little worried as they not only where building comb from the top guide, but also from the metal rod. But it turned out not to be an issue, as the comb guides along the side of the frames worked like a champ and everything lined up when they met. I had put this in a hive that was honey super cell frames since it would have uniform comb on both sides. They did draw out mostly drone comb, but this was expected since they had none with the honey super cell. Next year I will continue adding more of these frames and hopefully get the hive migrated over completely. How do you mean? Using staple spaceing of frames? Hoffman style end bars are wider at the top and narrower at the bottom. The wider top part is what controls the frame spacing. It is also a larger surface area for the bee to glue together with propolis. Where as using staples to control spacing greatly reduces the area that the bees can propolize. 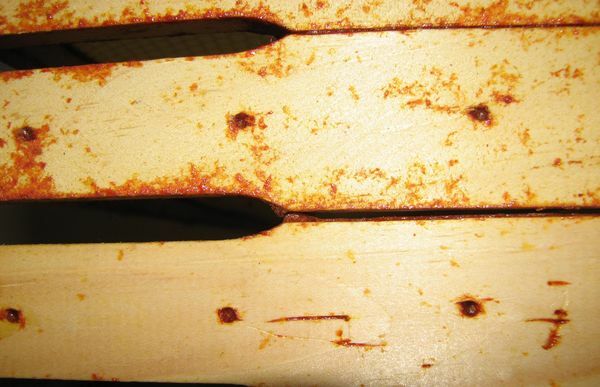 If you don’t keep the propolis cleaned off the Hoffman style end bars, it builds up and starts spreading the frames farther apart. I belive it’s been about a year since you used these double deep frames. How are they working out for you? Was the comb flat and supported well? I would like to try this, but I want to see how it worked out for you first. Thanks. I only introduced one frame last year as the bees where from a cut out and it took them a while to gain their strength back form loosing all their resources. I also didn’t want to leave any gaps of open space for the Winter if they did not complete drawing a frame. It has been a very cool Spring here, and I didn’t get to add any more frames until a week ago. I added 2 more empty frames, one on each side of the drawn out frame. If the weather ever warms up, hopefully I’ll have some updates and pictures within a month or so. I have been making hivebodies that are about 1 1/2 deep for a few years now and they have been producing perfectly straight comb. I use the top bars of a standard frame and make new side pieces for the additional length. A strip of all wax foundation is inserted into the top bar as usual abut only about 2 inches wide. 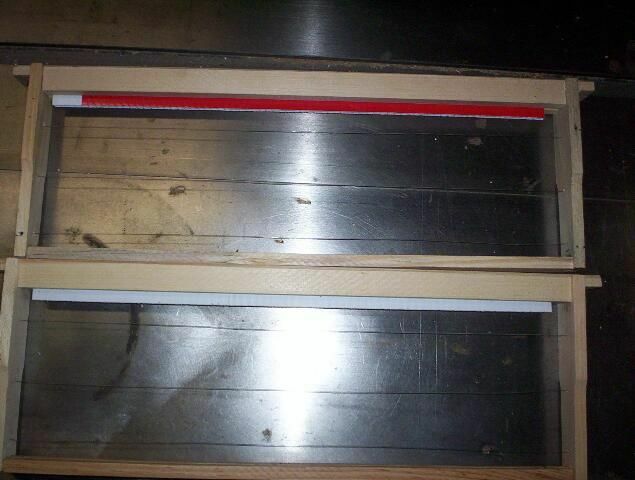 A wooden dowel is inserted between the top and bottom bars for support. The only problem was keeping the wax strip in place without falling out. Once the bees start building comb on this strip (i use small cell foundation), it comes out nice and straight , and is very strong. Sounds similar to what I have seen of Chris Harp’s method. Good to hear it has been working well for you too. I chose to model mine after the original Dadant deep with a horizontal wire and wooden comb guides on all the edges. Curved comb has not been an issue. I still struggle at times with them over drawing the comb into adjacent frame space when storing honey at the top of the frames. I find strips of coroplast (corrugated plastic cardboard) work great as starter strips. 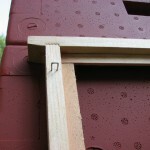 They fit perfectly in grooved top bars and one staple from an air nailer holds them securely. Can you tell me if there has been any determination on the single staple idea of propolis reduction? This is a great concept BTW and I will try it. Doesn’t using only a starter strip make the bees work a lot harder to build/draw out comb? Do you reduce the number of frames to nine once they are drawn? Can you tell me a good source for small cell foundation? I ffel this is going to be a very strong deterent to Varroa. Can you tell me if there has been any determination on the single staple idea of propolis reduction? Propolis traits can vary drastically from hive to hive, so one hive is not a good sample for a conclusive answer. For what it is worth, it is working quite nicely in this hive. 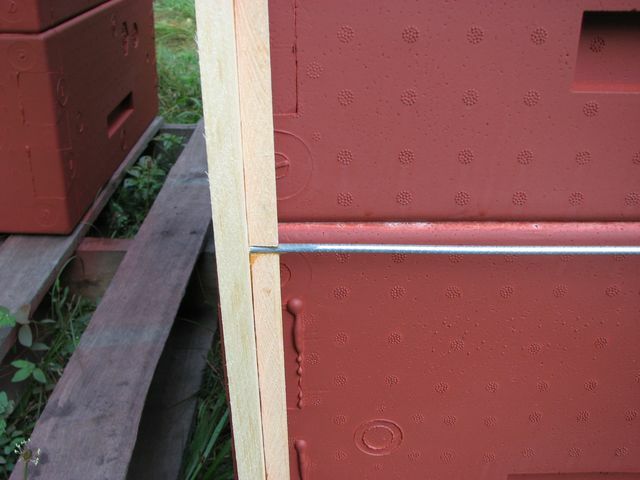 Doesn’t using only a starter strip make the bees work a lot harder to build/draw out comb? That is an often debated issue. One would believe it is more work since they don’t have a foundation to start with, but others will argue that bees prefer to build natural comb and work more efficiently by building down instead of out. Do you reduce the number of frames to nine once they are drawn? Actually, the frames are made slightly smaller than standard frames so that 11 fit. This provides a spacing that is closer to what feral colonies use for brood comb. Can you tell me a good source for small cell foundation? BetterBee sells 4.9 foundation as do some other dealers. The problem with commercial foundation is that all the wax is contaminated with the harsh chemicals from the commercial miticides. Great advice, Thanks for sharing…. Are you still using these frames? How are they working out? After reading a lot of Walt Wright’s stuff, seems like these would make the winter cluster more efficient and also help with swarming issues? Notice anything in those areas? This hive suffered with a laying worker late in the Fall and didn’t make it through the winter. I still have it, but have not had a chance to introduce another swarm yet. 1/ I understand about the Hoffman frame design being worse for propolis and so your decision to move to staples (or pushpins 🙂 for spacing, but the other benefit of the hoffman design is the ‘U’ shaped top structure which overlaps the top bar on both sides and allows added strength at the connection between top bar and side bars with both more glue as well as horizontal nails or staples. I was thinking about staying with a hoffman style design because I am worried about the added weight of the deep frames which primarily presses on the bottom bar and, from the bottom bar connection to the side bars, on the side bars. Did you have any concern with the weight of the frames you developed and the stress on this sidebar-to-topbar connection? 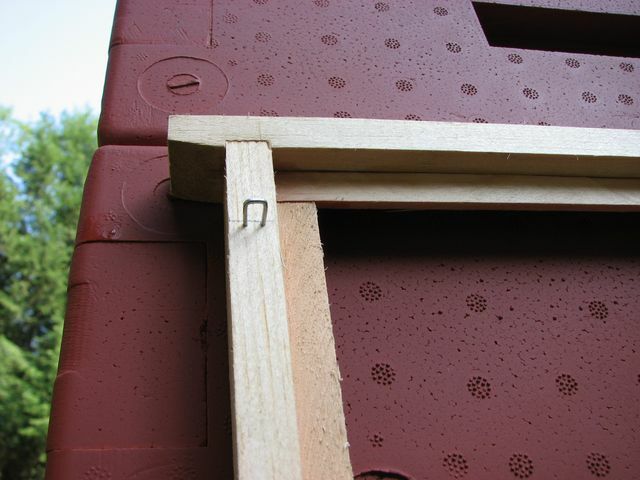 From you comments on propolis, I am thinking to reduce the vertical length of the ‘U’ shape at the top of the sidebar to the minimum for strength (maybe an inch or so) and to use your staple or pushpin idea halfway down the frame to assure the frame sits vertically. Would you think this is a good idea or not worth the trouble? (the straight sidebars are obviously easier to make than the hoffman style…). 2/ with the 1 1/4″ spacing (which I use too), would be concerned about pulling this deep frame out without rolling some bees. With a follower board and sticking to only 10 frames instead of 11, this concern could easily be addressed – do yo think it’s worth worrying about or was i as easy lifting out the 11th double deep frame as an 11th standard frame? 3/ aside from being able to use a stack of two standard supers, it seems like one could make any size frame with this idea, and since the frame is non-standard and will not be extracted, etc…, compatibility with standard super sizes seems to be the only reason to choose one size or another (with an obvious upper limit due to weight and strength, which your double deep fames would seem to be close to. I use all mediums and am thinking about adopting a similar design for a triple medium frame (18 3/4″ height), a double medium frame (12 1/2″ height) or a deep+medium frame (15 3/8 height). Are there any other considerations that make you believe there are advantages to the double deep height? 4/ Since this is all custom stuff, the top bar could be made thicker (and stronger) that the standard dadant 3/4″ top bar. Did you see any evidence of top-bar sagging and would you think there is any reason to be concerned with reinforcing the top bar of these double deep frames? What about if they are full of honey instead of brood? Same questions for the bottom bar. 1. You are correct, the U of the Hoffman frame is definitely a stronger design and yes I was a little concerned with my design. I did glue and staple them and in my limited experience had no issues. I must add that I never had a complete frame full of honey and I never pried up on the top bar. I always broken them loose by sliding them sideways before pulling them out. The staple spacers made sliding sideways rather easy as there was very minimal gluing of the frames. If you do go with the Hoffman style, just make it a habit to scrape it clean each time, even if it is only an inch. 2. I never had all 11 frames fully drawn, but if you did, and had the hive packed wall to wall with bees than rolling could be an issue. Using a follower board would help. 3. There is nothing magic about the 2 deeps, I just chose it because all my polystyrene hive bodies are deeps and that 2 deeps is the normal brood area for my area. I don’t see a problem with any of the other combinations you described. 4. I had no problems with any sagging. I believe the metal cross rod helped with this. 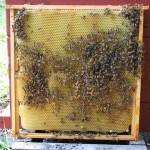 Without the rod, I could invision comb failure of new comb if it was packed with honey, and perhaps even frame failure. I am struggling with the same exact questions these days. I know it’s a little late in the year to start, but I’ll see how far I get. You say that you space your frames 1 1/4 inches. So, I assume you are building your frames from scratch, right? Because I was thinking that maybe I could use at least the top and side of my old Langstroth frames and adapt them. But the center to center spacing of these frames is more like 1 1/2 inches. I am also playing around with the idea of using only the top bars of the Lang frames with starter strips and, using half supers, create a Warre-type hive, where you add boxes at the bottom. What I like about that is the fact that brood comb gets created constantly new and you don’t have to worry about replacing it ever. I also like the idea of minimal intrusion into the hive. But it would be nice to re-use the materials I already have instead of making or buying new. I made two with double deep frames. but found the problem is no way to extract them. Supers are too big and get filled with honey instead of it being pushed up into the supers. Search for Gargantua on Beesource. I made a SC and a LC, but one or the other keeps dying. Also see giant swarm moving into one, search jollyollie8 in YouTube. I am President of Beekeepers of Shawangunk in Ulster County New York and I designed and built a hive called the XT18 which is displayed on my site that utilizes 18″ deep frames. The single brood box contains 14 frames which are all “double deep”. The XT 18 is supered also with a 14 frame super. If you would like to see the hive go to http://www.bosbees.com. The bees do quite well in this hive. Inspections are far less intrusive. 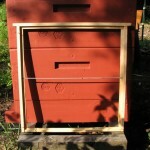 There are many other advantages of extended frame hives. talking about frames and strength check out a guy that makes and sells frames named Ferris. He is from Maryland, and has a website i think called Ferris Apairies. Extremely strong joint on his frames. Shows him hanging on one frame and he is about two hundred pounds. thought this may be a help to tou, as i saw you guys doscussing big and heavy frames. the strength comes from the joint he uses among other little things, i believe. good day ! Newbee question here: how do you extract honey from a frame that large. I’m assuming you don’t crush and strain. I would love to try my hand at large frames , but can’t justify buying the extractor that can accomodate them so early in my beekeeping game. 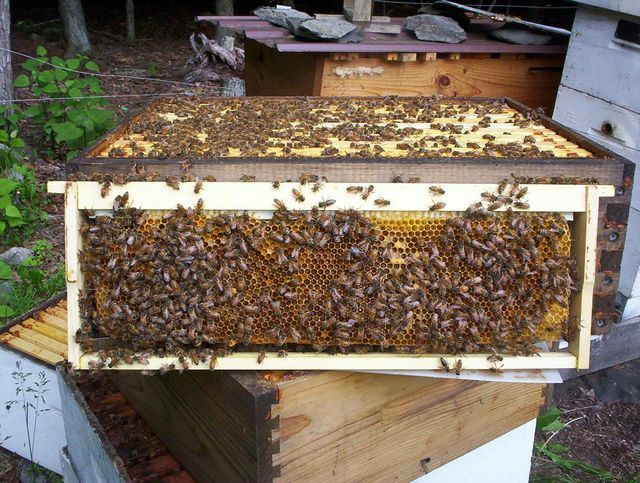 My question is: If I join two medium frames and use them in a layen hive, then separate them to fit in a conventional (borrowed) extractor, can I join them again to be reused? Will the bees accept a frame that has been “cut in half” and rejoined? I don’t think extracting is feasible, or at least economical, on the double deep frames. I use them for brood chamber and stores for the bees consumption. I have built my latest hives to hold 8 double deep frames and use medium honey super on top. 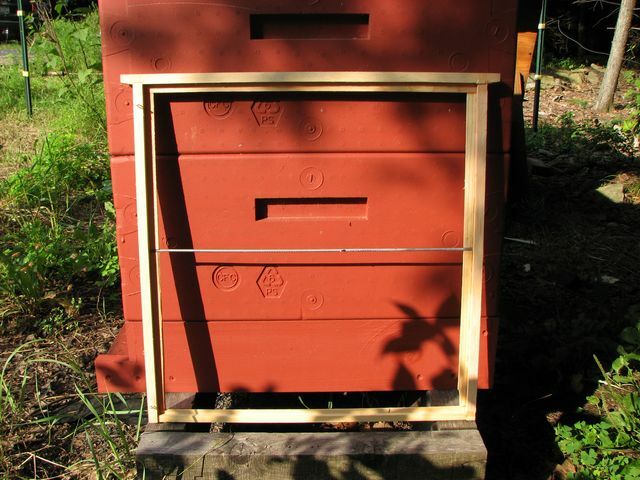 Although I do think there is some merit to the double deep frames, I’ not sold on the horizontal hives, especially in colder climates. Bees natural instinct is to work vertical like in a tree. It is a natural progression to move up the combs during winter and always have additional stores about them. Moving horizontal from comb to comb requires them to break cluster. 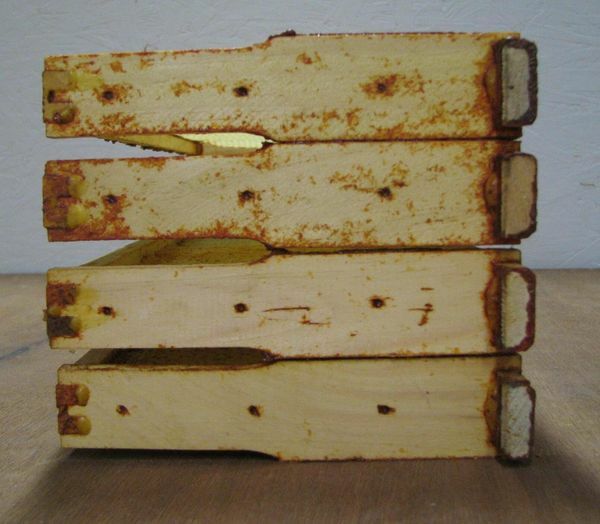 In Fedor Lazutin’s book he shows pictures of joining two frames to make his 18″ deep frame in his extra-deep frame horizontal hive which is similar to a Layens hive. Although this does add a horizontal wooden break in the frame, I think that is a much improvement on traditional Langstroth stacked hive bodies that leaves an air gap. The queen will be less impeded by a wood strip than by an air gap. I love the idea of large brood frames, and built some myself. It has worked perfectly. Id love to share them with younif you wish, the dimensions are standard lang widths, and 20″ deep. 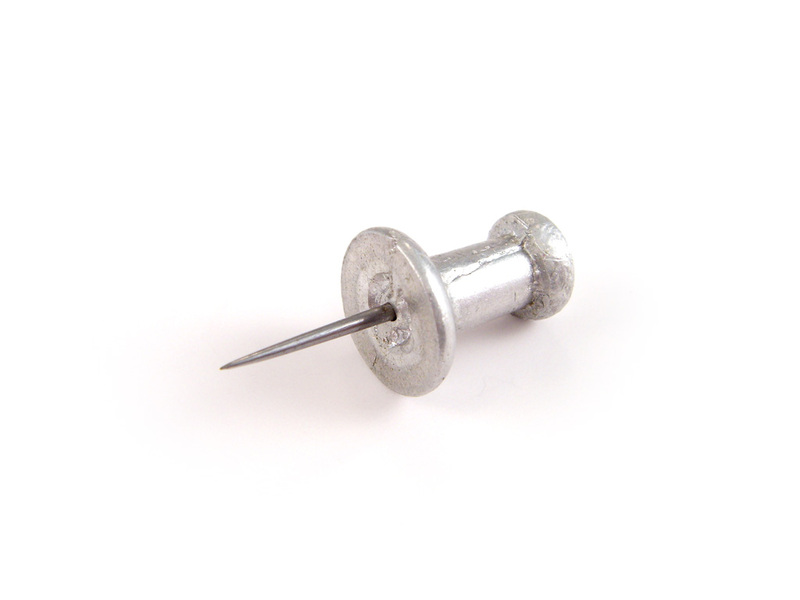 I use small screws to join them and they are very very solid! 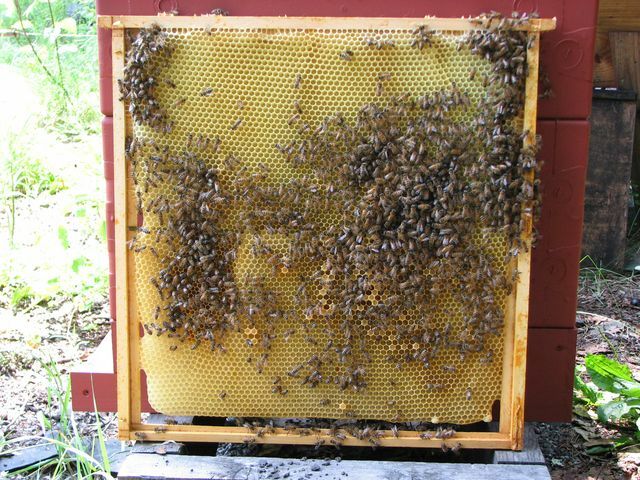 The bees love them, and by the way Mr.Dadant used large brood frames to great advantage! His were i think18″ deep. Mine are 20″ and the bees really like them, and i only have one brood box to check, and the queen can lay continously in a circular pattern uninterrupted! The bees draw thier lwn comb on these and they are just fine. I run standard frames above for surplus honey storage. One problem is that the bees put a lot of honey down below but there are so many cells in these large frames that one can get a very large brood nest rocking early also! Need more years to try it out more! I love the theory of double deep,I am curious about extraction of honey? Extracting is not something I am worrying about with my double deep frames. My main focus is giving them an uninterrupted brood nest as within a tree. I use them only for the brood nest and put honey supers on top for excess. As stated above, I believe a wooded break (joining two frames together) is better than an air gap. I have redesigned my double deep frames to hold two sections of plastic foundation. Personally I think trying to come up with a frame that can be taken apart for extracting is going to provide more challenges than benefit. These frames can be very heavy and need to be strong. I looked at someone’s setup with two meds attached and running lengthwise down into a layens type hive and the photos seemed to indicate it was working fine. Fedor Lazutin shows pictures in his book of deep frames with smaller medium sized frames attached to the bottom as well. I don’t doubt it works, but these frames can become quite heavy and need to be handled with care. Whereas a more robust frame will pose less problems. I’m working on the same concept right now. Was just wondering, ever have issues with the queen becoming honey-bound? If so, how are you fixing that issue? I was thinking about just taking one sheet of plastic foundation and putting it in the middle of a double deep frame vertically. Let the bees fill out the sides with what they want and leave it at that. I have never had an issue with honey-bound. Mainly because they most always have some foundation to draw as I try to grow my quantity of double deep drawn frames. My current design (shown in the picture above) will hold 2 pieces of plastic foundation either vertical or horizontal. I work with a fellow beekeeper that wanted to do exactly what you describe. That is why I built them that way. I prefer to use the foundation horizontal and use a half sheet on the bottom in the middle (two lower corners empty) to allow them to draw drone come. I put two of these sheet and a half foundation frames in a hive one in from the outsides. I’m not fond of running the one vertical in the middle because bee have a tendency to start curving the comb for strength when it gets wider that 12″. If you have ever tried a top bar hive (like my barrel hive) with bars longer than 12″ you will know what I mean. My buddy actually cuts the foundation in strips and runs two of them vertical. I do not like the mish mash of comb that he ends up with. Think you can share some more pictures of the frame you made? Wouldn’t mind getting some ideas from you. You can send them to my email or post them on here. I also wouldn’t mind hearing more about your experience with the double deep frames. Having one brood box sounds amazing. Thanks for the response. Unfortunately I don’t have many other photos of the frames and we are in the middle of winter, so no getting more for a few months. I plan to share more details of my double deep hive come spring. The frames are only a small piece of it. In the mean time I have emailed you the detailed plans for the frames. I am also considering making a super-deep, or whatever it’s called. 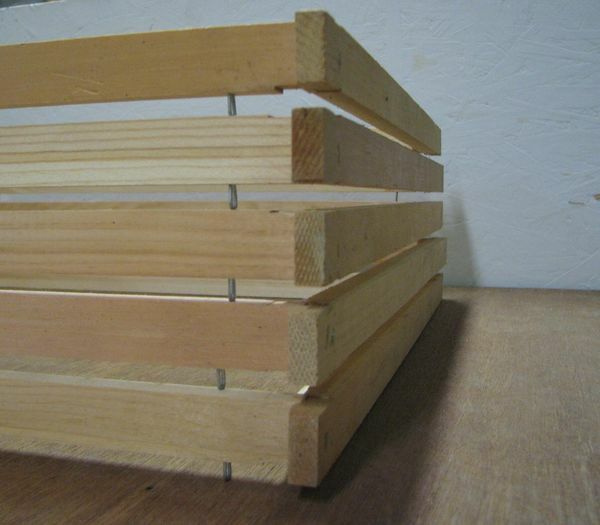 I run 8-frame mediums, so I am looking to do frames that will fit in an 18 inch tall brood chamber. Did you consider wires or rods running vertically in the frame? 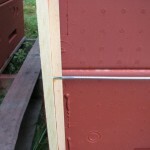 How did the bees do in extending the comb below the bar? On another note, I am using plexiglass inner covers on two beehives. One has a small notch for a top entrance/vent. The other has no top vent whatsoever. Your posts on Beemaster encouraged me to try it. Both are doing equally well so far. I thoroughly enjoyed the podcast. My eyes have been opened. After reading “Constructive Beekeeping”, and listening to you and others sing the praises of poly hives, I’m sold. Last year I built 4 complete 1.5″ thick hives, but now I found out they’re not even nearly thick enough. You mentioned something about bees not clustering in a large tree, until close to -40. Do you recall where you learned that? Also, any other info you can point me to on no-top-ventilation and studies on the thermodynamics of the hive would be helpful. The one remaining question I have is how air is exchanged in a hive, especially during the winter. I’ve tried using a FLIR, but I can’t seem to detect it. Is it solely due to convection? Any ideas? Check out Ratios of colony mass to thermal conductance of tree and man-made nest enclosures of Apis mellifera: implications for survival, clustering, humidity regulation and Varroa destructor. It is recent work done by Derek Mitchell in the UK. I spoke with Derek over a year ago and have been using some of his methodologies in the work I have been doing. Derek is who I was referring to in my talk. As far as winter air exchange, I would suggest reading Beekeeping for All by Abbe Warre, which has great information, including winter air exchange.